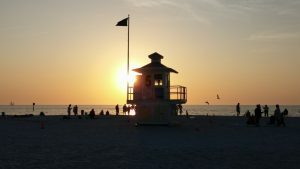 Readers of USA TODAY and 10Best.com have voted Clearwater Beach the best place to watch the sunset. We here at Florida Beach Rentals agree! 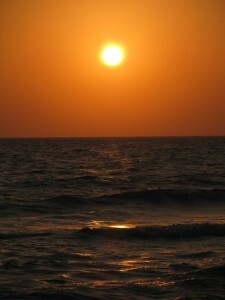 The Gulf of Mexico provides a variety of colors; turquoise and blue in the daylight and fantastic reds and oranges at sunset. The weather produces clouds over the Gulf quite often, giving the setting sun a tapestry to cast its colors upon. Many times clouds hover over nearby Tampa, making the Clearwater skyline a beautiful backdrop, with towering clouds lit with pinks, yellows, oranges and reds. With the over-land backdrop and the sun setting over the Gulf of Mexico, some of the sunsets at Clearwater Beach create strikingly beautiful images that will remain in your memories for a lifetime.